“There’s hardly another composer who would take a more solitary place in the family of Russian musicians” wrote Medtner’s contemporary and music critic Vyacheslav Karatygin. Medtner was born to a family of intellectuals of German descent who had long before settled in Russia. Even after three decades of emigration, he remained an essentially Russian musician till the end of his days. If Medtner’s music could not boast a great number of followers, it irrepressibly attracted such deep and subtle, though very different, artists as Rachmaninov and Myaskovsky. Medtner’s music organically combined traditions of German and Russian music. Along with Rachmaninov and Scriabin, Medtner was an outstanding interpreter of his own works and one of those who started a new era of Russian piano music. According to the prominent musician, pianist and thinker Heinrich Neuhaus, Medtner as a pianist “won himself an unfading glory… I couldn’t help feeling that it wasn’t just a marvelous pianist playing but a great musician, excellent composer, that his thought and ear had a total control of his fingers and his phenomenal virtuosity, and that it was an inspired pianism”. 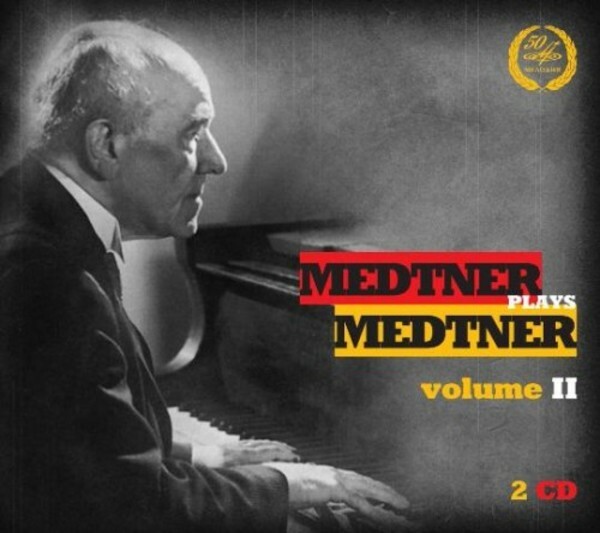 This second volume of the anthology includes three Medtner’s piano concertos recorded in the 1940s in London (the second and third ones were conducted by Issay Dobrowen, one of the renowned representatives of Russian musical emigration). The set also features one of the most original of the composer’s works – Sonata-Ballade, Op.27.